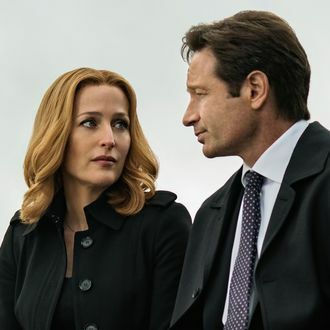 X-Files fans will get to see more of what inspired Mulder and Scully to become FBI agents with a new pair of young-adult novels, according to EW. Titled Agent of Chaos and Devil’s Advocate, the books will follow a 17-year-old Mulder and 15-year-old Scully, respectively, in the spring of 1979. “Why did Mulder become a believer? Why did Scully become a skeptic? We get to tell those stories,” publisher Erin Stein told the magazine on Monday. Kami Garcia will write Chaos, and Jonathan Maberry will pen Advocate — both for Imprint/Macmillan Children’s Publishing. Specific plot details are under wraps, but Imprint noted both prequel stories take place when “the occult, serial murder and government conspiracies” were making headlines. News of the books came the same day as the X-Files revival’s season finale. They’re slated for simultaneous publication in early 2017 — which gives you plenty of time to brush up on Stratego.